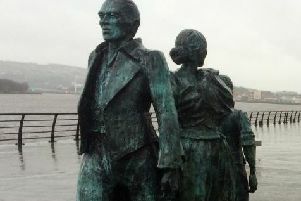 Many of those who led the orignial Civil Rights march in Derry, will retrace their steps at the helm of this year’s Foyle Pride Parade as the festival marks a 25 years milestone. Festival organisers and committee members gathered in the city centre on Tuesday to issue an open invitationto all as they launched the festival programme. A series of talks, theatre and concerts, community, sport and comedy events are set to be rolled out over the course of the festival, which runs from August 18 to 26. In a tribute to the Northern Irish Civil Rights Association and the fight for rights and equality, the parade, which follows the route of the original Civil Rights March of October, 1968, will be led by activists who were present on that day, including Bernadette McAliskey, Eamonn McCann, Dermy McClenaghan, Kitty O’Kane, Michael Farrell and Finbarr O’Dochartaigh together with the present Foyle Pride Committee. Later the same day it’s the Big Gay Bake-Off on Sunday, August 19, from 5pm to 7pm. Local people are being urged to use Fairtrade ingredients and invited to bring their finished home-baked cake masterpieces to The Garden of Reflection, Holywell Trust to enter, or to become a taster. The Chicken Box Comedy Open Mic takes place on Wednesday, August 22, from 8.30pm to 10.30pm at Bennigans. On Thursday, August 23 Sandinos Bar/Club will host experimental Malaysian indie punk band, Shh…Diam! supported by local artist, Roe. The annual Foyle Pride Parade takes place on Saturday August 25, departing the Waterside Train Station at 2pm. Anyone interested in helping to volunteer as a steward for the parade is asked to send a message to Foyle Pride Festival via their Facebook page.